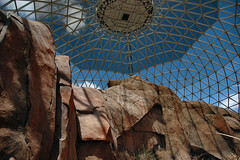 Inside the “Desert Dome” at the Henry Doorly Zoo in Omaha, Nebraska. It was pretty impressive, with multiple desert environments separated by the stone hills seen here; there was also a cool nocturnal exhibit underneath. It reminded me of nothing so much as the forest biodomes on the Valley Forge in the movie Silent Running.